The town of Atru in east Rajasthan is home to 8 Hindu and Jain temples that date to the 9th and 10th centuries. These temples are now dilapidated and include a Vishnu temple which is known locally as “Gadgach” or “Disorderly Heap” (Mankodi 2016). In 1905, the villages temples were described by D.R. Bhandarkar in an Archaeological Survey of India (ASI) progress report, and the whole area was declared by the ASI to be of national importance and thus under its protection. In 2007 the ASI “decided to clear the scattered debris beneath the visible parts of Gadgach”, exposing the north side early plinth of the structure, which was decorated by, among other motifs, with four in situ maithunas (Mankodi 2016). 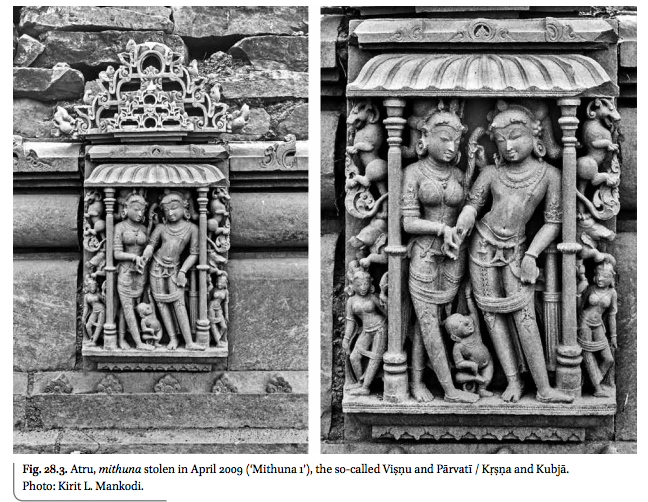 In Indian art, the concept of maithuna (spiritual transformation via either physical or metaphysical sexual union), is depicted in the form of couples entwined in embrace, referred to as “loving couples”. They are a popular motif in Indian art and largely due to the sexual nature of the iconography, are popular among collectors of Indian art on the international market. In 2009, two of the newly-exposed maithunas were stolen. On the night of 22/23 April, the western-most (farthest right) maithuna was stolen, potentially because it was the closest to the site’s gate (Mankodi 2016). It weighed around 350 pounds (Mashberg 2014). In response to the theft the ASI lodged a report of the crime with the police, but the report lacked a photograph of the missing piece. Four months later, on the night of 18/19 September 2009, the eastern-most (farthest left) maithuna was stolen, and again a report lacking a photograph was lodged with the police (Mankodi 2016). It weighed around 400 pounds (Mashberg 2014). In 2010 the second maithuna (the one stolen on 18/19 September) was pictured in an advertisement for the London-based dealer John Eskenazi on page 61 of the March-April issue of Arts of Asia. A Mr M. Postel, a French national with an interest in the art of Astru, recognized the piece and notified Mr Rajan Mathai, India’s ambassador to France (Mankodi 2016). 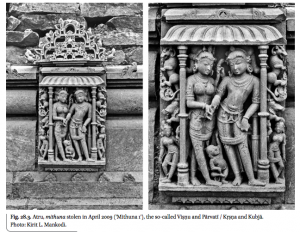 Meanwhile, Kirit L. Mankodi, who was present at the excavation of the maithuna in 2007, presented his own photographs of the missing statues and requested that the Indian High Commissions be alerted (Mankodi 2016). Interpol then issued an alert for both missing maithunas. Meanwhile the advertised maithuna was shipped from London to New York where it was intercepted by US Homeland Security in April 2010. 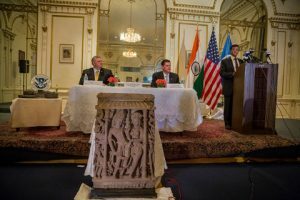 On 9 July 2012, Assistant District Attorney for Manhattan Matthew Bogdanos confirmed that both statues had been found in New York and that he expected repatriation to come soon. 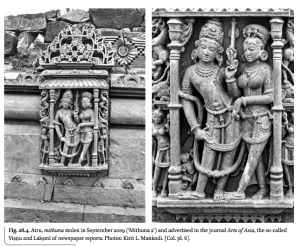 The two maithuna, as well as another stolen Indian piece, a 11th/12th century Bodhisattva from either Bihar or Bengal, were formally returned to India in early 2014. According to US Immigration and Customs Enforcement, the second maithuna had been transported from India to Hong Kong where it was sold to a dealer in Thailand and then re-sold to a buyer in London who shipped it to New York City for an exhibition held in March 2010. It was seized by Homeland Security on its way back to London. The first maithuna to be stolen had been transported from India to Hong Kong then sold to a buyer in New York, who sold it on to a buyer in Basel, Switzerland (ICE 2014). 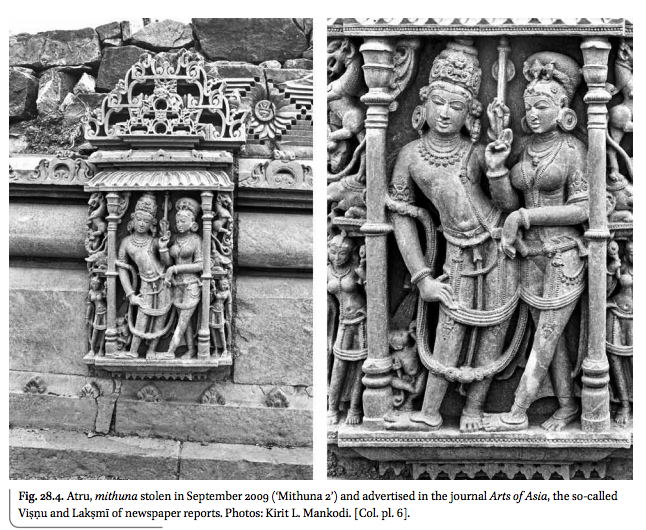 Mankodi, Kirit L. (2016), “The Case of the Contraband Cargo, or, Atru’s Amorous Couples”, IN Temple Architecture and Imagery of South and Southeast Asia, Parul Pandya Dhar & Gerd J.R. Mevissen (Eds), New Delhi: Aryan Books International.